Assam State Transport Corporation, Guwahati. 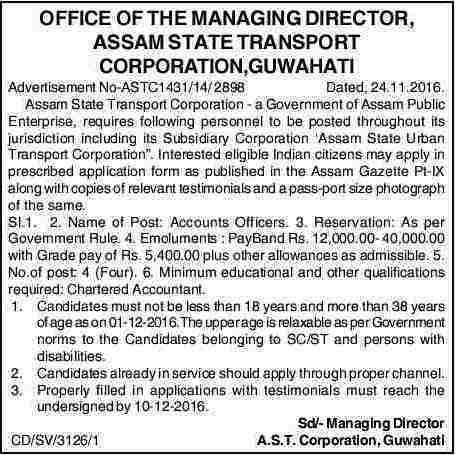 Applications in Standard Form are invited from eligible Indian citizens for filling up of the following vacant posts under Assam State Transport Corporation, Guwahati. Age: 18 to 38 as on 01.12.2016 . How to apply: Interested candidates may apply in Standard form along with copies of relevant testimonials and a passport size photograph within 10th December 2016.